Just moments after reporting Pioneer's commitment to continually update the first generation AppRadio firmware, we've learned that an updated firmware version 2.50 was released to European AppRadio users. This update is not available in the US yet but it is coming soon (by the first week of May?). AppRadio has had many issues since launch but the last update version 2.45 seemed to have worsened the problems. Too many popup warnings were hampering the device. One hopes this latest update fixes those issues. The update will have to be installed using a micro-SD card, just like before. Pioneer has promised continued support of it's first generation device through regular firmware updates. 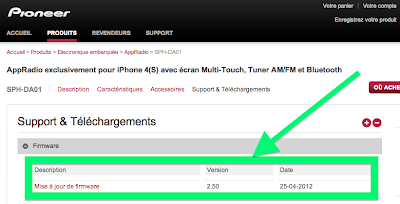 A complete revamp of the firmware to make it look like AppRadio 2 is highly unlikely though, due to hardware constraints. But sources have mentioned an improved user experience in the coming few months for AppRadio users. Let's hope things keep getting better for AppRadio. Even though it's a first generation product it is still quite a formidable device that integrates the iOS experience in your car.